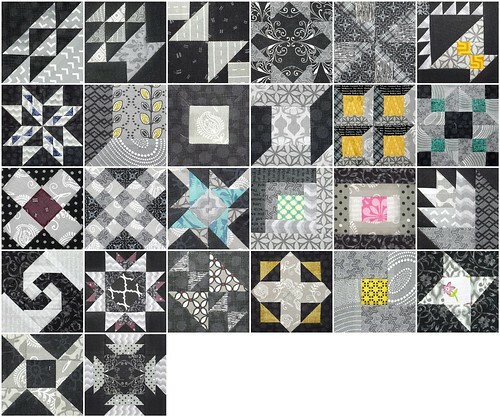 Once again, I let myself get behind on the 365 Challenge Quilt Sampler blocks. By almost a month. I really need to not do that again. I spent this weekend catching up on twenty-four blocks. Tonight, I re-made one and did the block for the day. 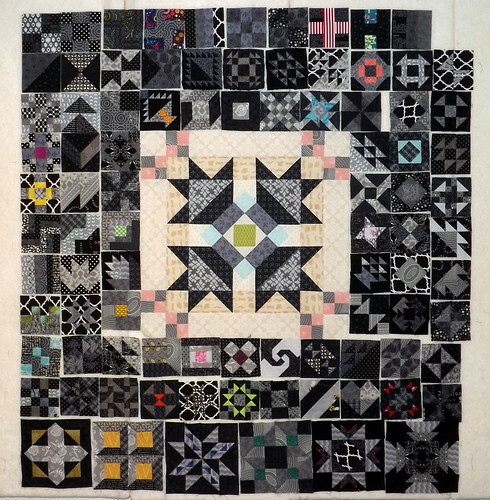 I have to admit, I decided not to traditionally piece quite a few of this particular batch of blocks, like Log Cabin, Courthouse Steps, Pineapple Plant, and Pinwheel Star. I felt like I’d end up with more accurate results, and it took the headache out of them for me. I will say I’d really like to not have to any blocks with miters in them for a while. And I still hate basket blocks with a fiery burning passion. I’m also very glad that we should be getting to do 6″ blocks with more regularity. So, having made all those blocks, I was compelled to put them all together, just to get an idea of where I’m heading. When it comes time to assemble the 3″ blocks into their inner border, I will have to make sure to scatter those pops of color. I will also possibly need to re-make more blocks, in order to add more color. So far, though, the 3″ blocks I have now should work well. Oh, and I cut 1.75 yards from stash, to supplement the dwindling supply of black and grey scrap I have. These blocks would have probably used up quite a bit more yardage, if I hadn’t wanted to work from scraps as much as possible. All together, this looks really amazing!